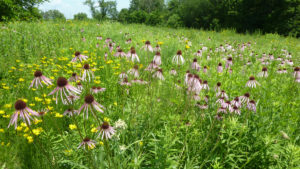 Pale purple coneflower in Biocore Prairie. Photo by Bryn Scriver. The University of Wisconsin-Madison Lakeshore Nature Preserve permanently protects the undeveloped lands along the shore of Lake Mendota where members of the campus community have long experienced the intellectual and aesthetic benefits of interacting with the natural world. The Preserve shelters biologically significant plant and animal communities for teaching, research, outreach, and environmentally sensitive use, and safeguards beloved cultural landscapes. The Preserve is as essential to the university as its lecture halls, laboratories, and playing fields. It contributes to a powerful sense of place and fosters an ethic of stewardship to promote mutually beneficial relationships between humans and the rest of nature.